If you’re holding on to a precious few vacation days this holiday season and scouting around for a wise investment, place your bet on Hong Kong, which turns into a winter dreamland during its annual WinterFest: a huge sparkling Christmas tree in the heart of Central, a lively market in Victoria Park, carnivals and light shows on both sides of Victoria Harbour — all culminating in an epic New Year’s Eve fireworks show. Hong Kong in December puts on quite the show for visitors, and offers even more possibilities than it usually does. Here’s an itinerary that gives you a sampling of everything we love about the city. Make an event of the day’s first meal by indulging in local fare such as yum cha (literally “drink tea”), the traditional Cantonese brunch of tea and dim sum, at Dim Sum Square (88 Jervois St, Sheung Wan; +852 2851 8088). A few years ago, this neighborhood hole-in-the-wall had only a few tables, but thanks to its ever-growing popularity, it’s now a mid-sized dim sum hall in Sheung Wan. Apart from all-time favorites like shrimp dumplings and glutinous rice in lotus leaf, we highly recommend a couple of other bestsellers, the BBQ pork pineapple buns and the crispy spring rolls wrapped in sticky steamed rice rolls. Another dining experience unique to Hong Kong is the cha chaang teng, or the Hong Kong-style tea house. These joints serve a unique hybrid of Chinese and Western cuisine known as “soy sauce Western”, a reflection of the cultural mix that the city has witnessed throughout history. 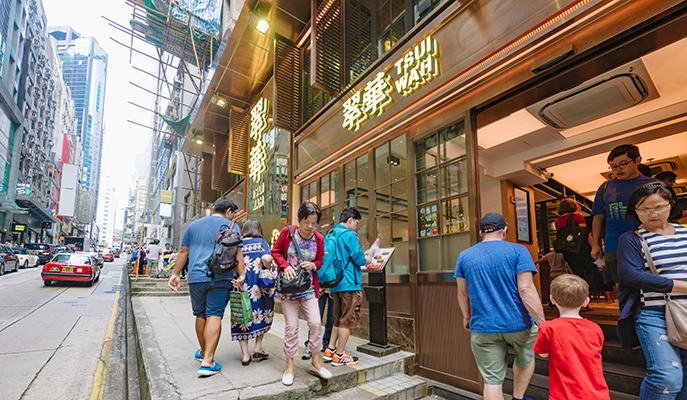 Visit the legendary Tsui Wah (15 Wellington St, Central; +852 2525 6338) where you can indulge in a warm Hong Kong-style French toast (with a thick slab of butter), which is best washed down with a hot or cold nai cha (milk tea). For something savory, you can mix and match several meat options that come with either rice or noodles. If you can’t decide between coffee or tea, order a cup of hot or cold yuen yeung, which is three parts coffee and seven parts tea. Browsing the shops of big luxury brands at the Central malls always makes for a fun afternoon of trend-spotting, but make a turn for the smaller designer boutiques in the SoHo district and things can get truly interesting. Start out at PMQ (35 Aberdeen St, Central), an arts and culture hub that was a public school and a police quarters in its previous lives. When the Central School was built in the late 1800s, it was the first of its kind to provide Western education to the Chinese-speaking public in the British-occupied territory. The building, damaged during World War II, was rebuilt in the 1950s postwar architectural style as a police residence, specifically for married junior police officers. The Police Married Quarters was then abandoned in 2000, only to be revitalized by the government nearly 10 years later as a new center of creativity. PMQ hosts nearly 100 galleries and boutiques selling ready-to-wear clothing items, accessories and artwork by both established and up-and-coming artists and designers from Hong Kong and abroad. Prices for the mostly limited-edition artisan wares are on the high side, but this month the establishment offers the PMQ Tourist Privilege Programme, which gives overseas tourists promotional offers and discounts to a range of stores in the building. But even if you don’t buy anything, walking through PMQ is an experience itself that feels like being transported to a contemporary art museum or a trendy fashion district bursting at the seams with forward-thinking ideas. There are also a few bars and restaurants around in case you want to take a food break or grab a drink, and if you come at the right time, there might be a lively street market or a live performance in the PMQ courtyard (check the event schedule at pmq.org.hk). Another talk of the town is Grana (grana.com), a Hong Kong enterprise that fashions itself as a purveyor of high-quality, minimalist and affordable clothing. Customers are only allowed to order their clothes online, keeping up with the rising trend of online shopping in this city with rocketing real-estate costs. 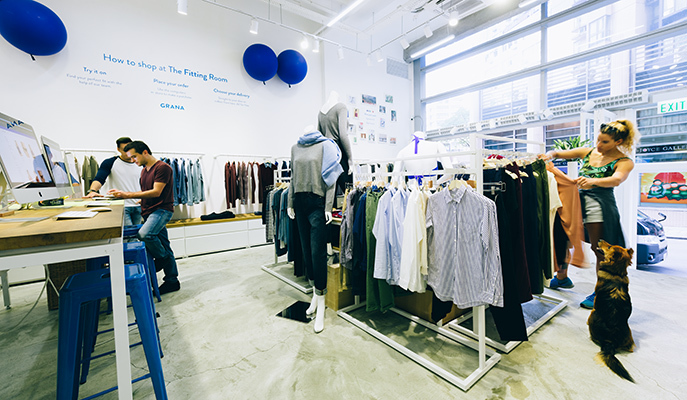 But what distinguishes Grana from other online retailers is that they combine online shopping with a touch of offline reality: stop by their stylish Fitting Room (108 Hollywood Rd, Central) to try any piece. If you like it, place an order online by 2.30pm and pick it up the following day from 5pm onwards. 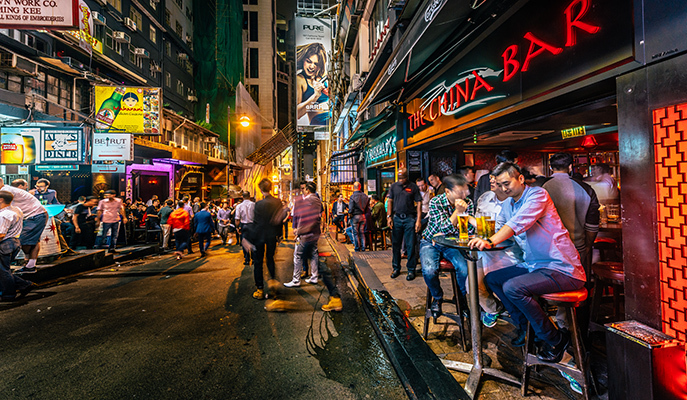 There’s much more to Hong Kong nightlife than the notorious bar district of Lan Kwai Fong. Alternatives include mingling with the artsy crowd at Peel Fresco (49 Peel St, Central; +852 2540 2046), one of a few live music venues in the city. This month, Peel showcases a nice mix of local and foreign bands representing diverse musical genres. If you like to be under the spotlight, join the open-mic jams on Tuesdays. If you’re in the mood for a spot of Latin dancing, grab a partner and salsa at Morrison Café & Bar (284 Queen’s Rd Central, Sheung Wan; morrisonhk.com). The bar is named after Jim Morrison of American rock band The Doors, but it’s better known for its Latin dance music, at least on Friday nights. This is where many of Hong Kong’s salseros and salseras congregrate on Fridays, when the DJ spins a variety of Latino tunes and free salsa classes are offered from 8pm to 9.30pm. And if your taste is more electronic, dance the night away with the fashionable crowds in the clubs of Jervois Street. Nature is the best detox after a night of partying. 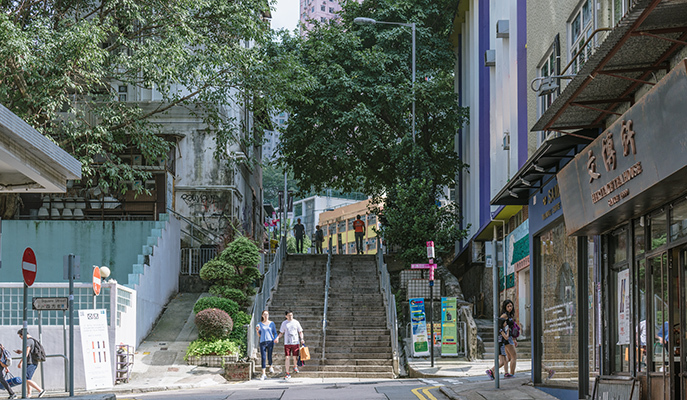 Many visitors are surprised to know that 70% of Hong Kong is undeveloped natural landscapes, and hiking is one of the favorite pastimes of Hongkongers, especially in cool months like December when temperatures fluctuate between 15 and 20ºC. The topography offers so many options that you can allegedly hike a different trail every day for a whole year, but a local favorite is Dragon’s Back (named after the shape of its hills). To get there, take a cab or bus number 9 from Shau Kei Wan MTR station to the To Tei Wan bus stop. Clear signs mark the beginning of the trail. Start your hike before noon to enjoy the fresh air, the calmness, and the unobstructed views of rolling green hills and clear blue sky. It’s a spectacular hike that will take you to two beaches: Big Wave and Shek O. 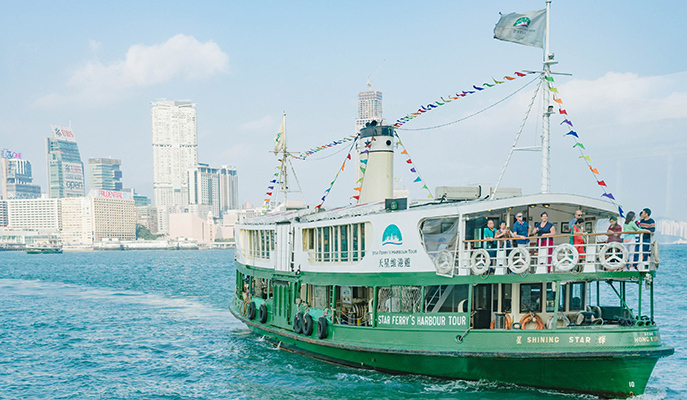 Beaches aren’t the first thing that come to mind at the first mention of Hong Kong, but this city — better known for its towering architectural marvels and a dense urban center — encompasses a whopping 263 islands, many of which come with a beach or two. Beach bumming is another local-favorite pastime, so if the weather is not too cold, we highly recommend it. And if the water is not too freezing, by all means take a dip. Your reward at the trail end of Dragon’s Back is Big Wave Bay Beach, where locals get their surfing fix. Stop by one of the Chinese BBQ joints for a laid-back lunch in the small village by the sea. 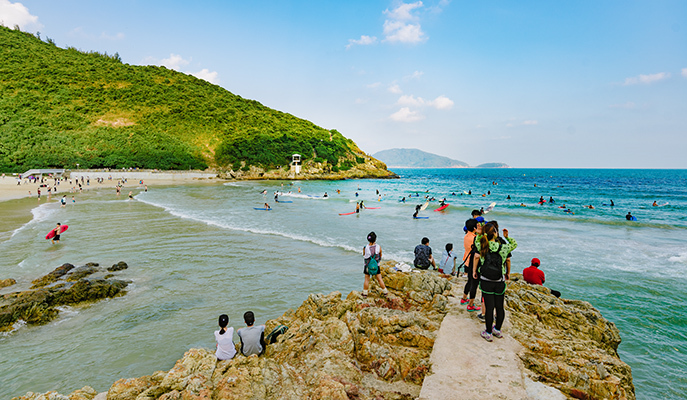 The better-known beachside village of Shek O is a leisurely half-hour’s walk from Big Wave Bay, and if you do make it there, stop for lunch at the Happy Garden Thai Restaurant (G/F 786 Shek O Village; +852 2809 4165). 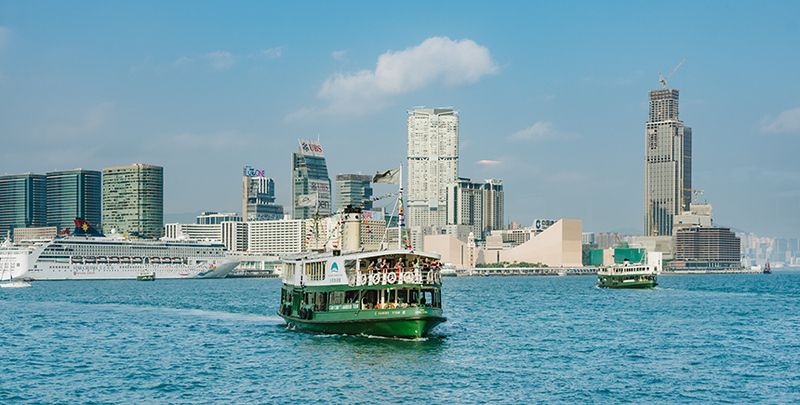 Hop over to the Hong Kong Cultural Centre (10 Salisbury Rd, Tsim Sha Tsui; +852 2734 2009; hkculturalcentre.gov.hk) on the edge of Kowloon — the interesting-looking building with a curved roof that you see on the harbor. The December program of the Cultural Centre is a fun mix of experimental theater and classical performances by the Hong Kong Philharmonic Orchestra and the Hong Kong Ballet (The Nutcracker is playing this month). This is a great spot for snapping photos of the iconic skyline during the nightly light show — if you’re lucky, you might even capture the traditional-looking Aqua Luna ship sailing by. While you’re in the area, the touristy-but-charming Star Ferry (starferry.com.hk) is an affordable $3 ride across the harbor, where the view is worth a million dollars. You can make the pilgrimage towards the “Big Buddha” (Tian Tan) out in Lantau Island, a standard fixture on most guides to the city. It’s truly stunning and worth the trek, but if you want to go somewhere closer, the Sik Sik Yuen Wong Tai Sin Temple (2 Chuk Yuen Village; close to Wong Tai Sin MTR station) is a popular destination among many locals, largely because it promises to “make every wish come true upon request”. Not far from the temple are Chi Lin Nunnery (5 Chi Lin Dr, Sheung Yuen Leng) and Nan Lian Garden (close to Diamond Hill MTR station — one stop from Wong Tai Sin), which are pockets of tranquility in the city showcasing a fascinating display of Buddhist architecture and artifacts. The Tai Ping Shan neighborhood, aka Hipsterville, was once a garrison for the British colonial forces, then a red-light district, before it was devastated by a plague in the 1890s. Today the neighborhood has been completely reinvented as a magnet for lovers of art, fashion and anything cool. Explore the many varieties of tea at Teakha (18 Tai Ping Shan St, Tai Ping Shan; +852 2858 9185; teakha.com) or have a vegan or vegetarian meal up the steps of Pound Lane next to the yogis at MANA! (8 Tai On Terrace, Sheung Wan; mana.hk). It’s a beautiful neighborhood with old Chinese low-rise walk-up buildings, street art (don’t miss a photo-op with the Space Invader), designer boutiques, art galleries and bohemian cafés. 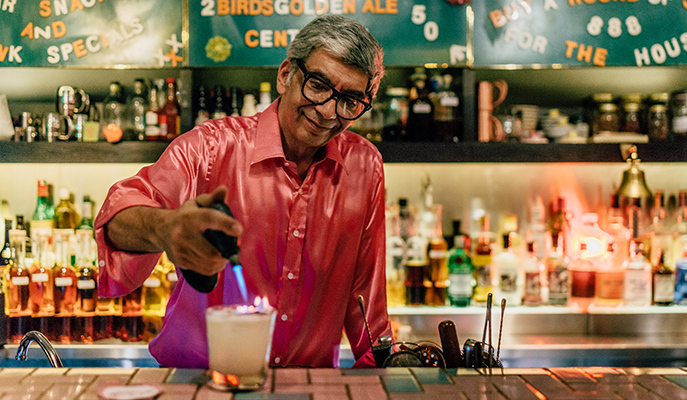 Hong Kong’s cityscape — with its tight alleys and discreet corners — lends itself well to on-trend speakeasies, and there are a couple you shouldn’t miss. There’s Mrs. Pound, a two-year-old speakeasy infused with the moody glamor of the old Shanghai underworld. Named after a famous 1950s burlesque dancer in Shanghai, the fictional tale behind the bar lends it an even more enigmatic vibe — the “devastatingly charming” Mrs. Pound, the story goes, ran away with a wealthy lover and lived in secrecy behind a traditional stamp shop. This stamp shop is now a speakeasy and restaurant, but to get in you must find the secret button (hint or spoiler alert: stamp). The menu lists inventive, eclectic fusion dishes ­— like Avocado Fries, Rendang Bao and Tuna Larb — as well as a selection of equally experimental cocktails. Tom Yum Bloody Mary, anyone? At the up-and-coming Sai Ying Pun district, find your way to Ping Pong (135 Second St; pingpong129.com), another speakeasy that opened a couple of years ago. The space was an old table tennis hall, hence the extremely high ceilings. It’s not so easy to find unless you see the crowds hanging outside. Look for the Chinese parlor-style red door — it opens into a secret Spanish gin and tonic bar. They serve any kind of gin and tonic you can imagine, but offer other enjoyable libations as well. Gin bars are the new whiskey nooks, and ever on the cutting edge, cosmopolitan Hong Kong has some of the best. This article originally appeared in the December 2016 issue of Smile magazine.